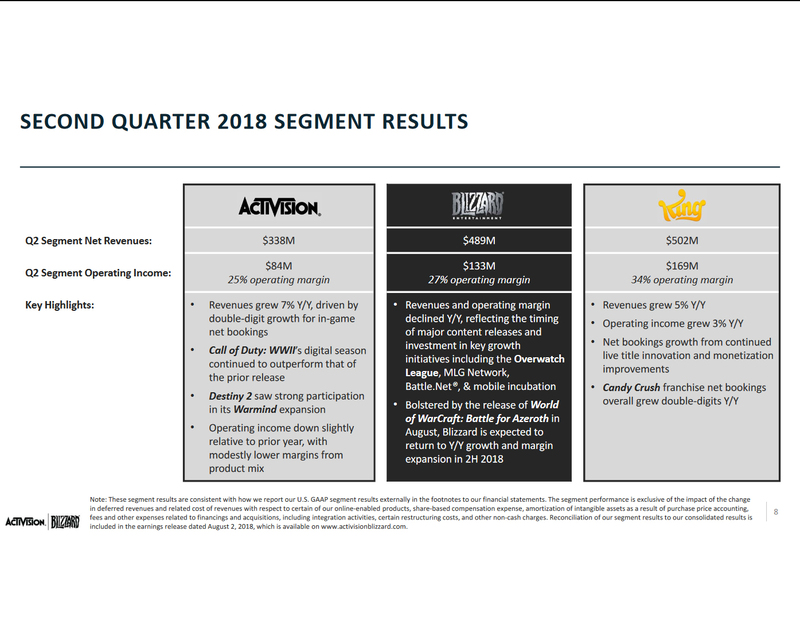 The Activision Blizzard Q2 2018 took place today Aug 2 to recap the financial earnings, and status of recently published game expansions or upcoming ones. The Overwatch League Grand Finals was the culmination of a successful inaugural season of celebrating our players, attracting invaluable team owners and partners, and delivering premium viewing experiences. We’ve recently announced the first set of season-two team sales, welcoming new team owners to the league with more to come. The Overwatch League held its Grand Finals event at Barclays Center in New York on June 27-28. The Grand Finals had a sold-out live audience and millions of global viewers watched on TV networks and streaming platforms. The hard-to-reach 18-to-34 demographic made up approximately 70% of the global audience. World of Warcraft momentum remains high ahead of the upcoming expansion, Battle for Azeroth, which is seeing strong pre-orders. Blizzard is building on the excitement around the Overwatch League with more eSports events and a continuous stream of content for the game in the second half of this year, including seasonal events, maps, heroes, and new cosmetic items. Pre-purchases for the upcoming Hearthstone expansion, The Boomsday Project, are tracking ahead of any prior expansion at the same point in time pre-release. 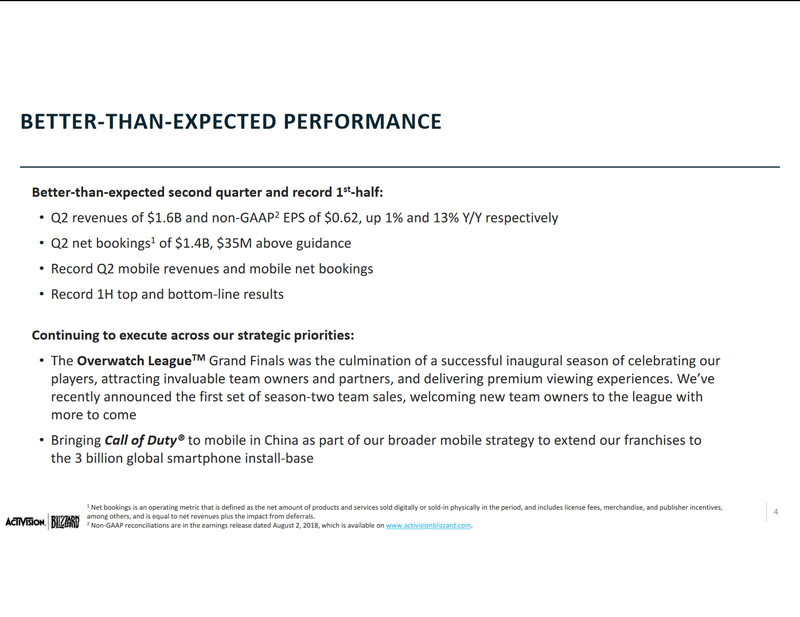 Key Highlights: Revenues and operating margin declined Y/Y, reflecting the timing of major content releases and investment in key growth initiatives including the Overwatch League, MLG Network, Battle.net, & mobile incubation. Bolstered by the release of World of Warcraft: Battle for Azeroth in August, Blizzard is expected to return to Y/Y growth and margin expansion in 2H 2018. Bob Kotick: Our results for the Q2 exceeded our prior outlook and we delivered record first half revenues and earnings per share. Our franchises continue to entertain large audiences, drive deep engagement, and attract significant audience investment. We have unique assets and capabilities. Many of today’s most-successful technology companies commercialize content they themselves create. Either user-generated content, or content produced by outside parties; and usually through a single type of monetization: either advertising or subscription fees, as examples. We are both. We deliver our own content, interactive and live linear programming on mobile devices, personal computers, and game systems in almost every country of the world; and we are one of the world’s best creators of professionally-produced content. Over 350 million consumers consume our content each month and when they engage, they spend roughly 50 minutes-per-day and can invest in our content through purchases from both online and physical retailers, subscriptions, downloadable content, virtual and physical items, and through participation in digital advertising. Virtually, all of our content is based on intellectual property we own and created by our wholly owned studios in the U.S. and Canada, Europe and Asia, and staffed by the most talented programmers, designers, artists, and animators in the world. We are in a privileged position. We have a direct digital connection with our customers: We are a creator of premium content, and we have multiple monetization models at scale. Our success is driven by the enthusiasm our audiences have for our products, and for the linear content inspired by our games. Perhaps most importantly, the loyalty our audiences have for our franchises comes from an unwavering commitment we have to creating the very best content year after year. We do this in recognition of the commitment our audiences make to us and the sense of belonging, meaning, and purpose our communities uniquely engender. The engagement of our community members builds passion for our franchises that extends well beyond games, as we saw this past weekend with millions of spectators watching the Overwatch League Finals. And we will see this loyalty on display again in November, when we host the Overwatch World Cup Finals in Anaheim. We are just scratching the surface on the full potential of our eight $1 billion franchises, and our network of hundreds of millions of users. We have taken some of the most important first steps in meeting our fans’ desires to have more of their favorite franchises in their everyday lives. In the last year, we have paved the way as the industry leader in eSports, making our franchises even more enduring. We are also making important progress across all our mobile initiatives, which will increase the reach of our games significantly. Last weekend, the Overwatch League held its inaugural Grand Finals event at the Barclays Center in New York. The event was the culmination of a very successful inaugural season. Our incredibly talented employees built a global competitive league from the ground up; and in our first season alone, we brought celebrating our players to a new level, our live events and viewing experience and world-class production quality on par with the best of professional sports. We teamed up with twelve extraordinary team owners, we attracted some of the best traditional and eSports partners (bringing years of invaluable experience to the league), we brought the power of professionalized eSports to multiple partners, we signed media rights deals with the leaders in streaming and traditional broadcast, and attracted global brands to serve as inaugural season sponsors; and we held the sold-out championship in New York’s Barclays Center with millions of global viewers watching the finals, including through our own MLG network and broadcast partners like Disney and Amazon. Our unique approach to eSports, with a focus on city-based teams, professional players, structured economics, and premium content has already started to pay off for our partners, our shareholders, and most importantly: our players. Today, we announced the first set of Season 2 team sales, welcoming new team owners from across the globe into the league. These great partners have seen the success of the Overwatch League and the opportunity to help build the sport of the future. We are thrilled to partner with them, and look forward to announcing additional new partners for Season 2 throughout the rest of this year. As the mainstream popularity of eSports continues to grow, we are well positioned to leverage the success of our Overwatch League model to develop new eSports opportunities in the future. While eSports give our existing fans a new and everlasting way to celebrate their favorite games and expands the appeal to broader audiences, our mobile initiatives will expand their access to our iconic franchises by making them available to hundreds of millions of new players around the world. We have multiple mobile initiatives underway, including some with partners with strong mobile experience and local market web knowledge. Today’s Call of Duty mobile game announcement with Tencent is part of our effort to ensure our very best franchises are available to mobile audiences in all geographies. We had a record last six months and we are excited about our upcoming releases: including World of Warcraft Battle for Azeroth, Call of Duty Black Ops 4, and a major franchise release from King. As always, we thank you: our shareholders and our partners, as well as our talented teams around the world, for all of your support and hard work. Collister Johnson: Moving on to Blizzard, which had 37 million monthly active users — again ahead of their big second-half content push which starts on August 14, when Blizzard will release Battle for Azeroth (the latest expansion for World of Warcraft). Battle for Azeroth adds to the already deep World of Warcraft universe with an array of new zones, dungeons, raids, items, and creatures. Players will get to unlock new races to make characters more customizable than ever, and Blizzard has added even more social features, letting players stay connected to their friends and family even outside their guild. Momentum remains high ahead of the launch with pre-orders coming in strong. For Overwatch, Blizzard is building on the excitement around the Overwatch League with more eSports events, and a continuous stream of in-game content in the second half of the year, including seasonal events, maps, heroes, and new cosmetic items. And for Hearthstone, anticipation for The Boomsday Project expansion is running high with pre-purchases tracking ahead of any prior expansion at this same time in pre-release. We think some of that momentum is due to a new offering that gives players more choice, including a premium bundle with extra card packs and an alternate hero. As Bobby shared, we saw significant engagement in particular around eSports with interest in the playoffs and championships for the Overwatch League, running above even our own high expectations. In summary, we continued to perform in our core business, while investing in building internal capabilities for a broader set of experiences around our franchises: including mobile, eSports, and advertising. 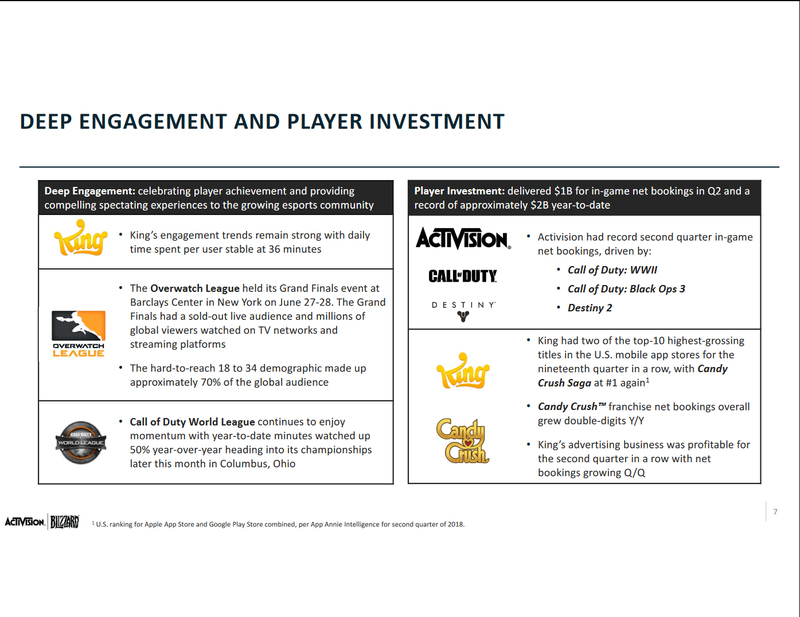 You are seeing early traction on some of those initiatives, including upcoming mobile releases, clear momentum for the Overwatch League and a ramping advertising business. 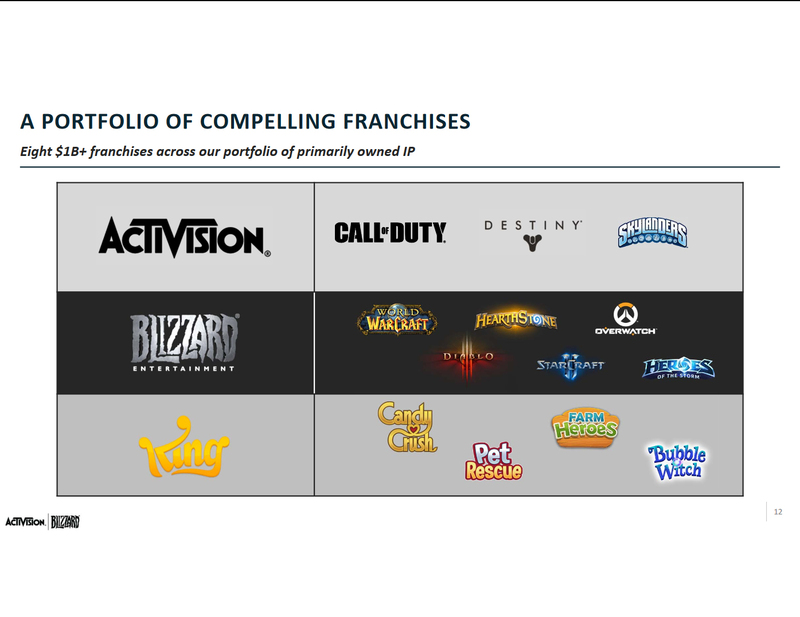 Spencer Neumann: Blizzard revenue and operating margin declined year-over-year. 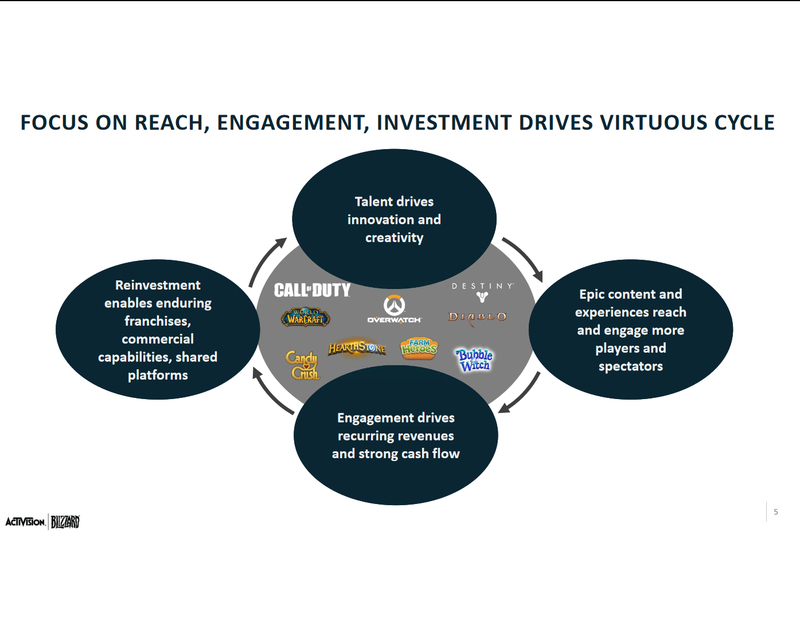 This reflects the timing of major content releases and investment in key growth initiatives: including Overwatch League, MLG Network, Battle.net, and mobile incubation. All consistent with our discussion on the prior quarter’s call. Bolstered by the release of Battle for Azeroth in August, we expect Blizzard to return to year-over-year growth and margin expansion in the second half. Now let's turn to our consolidated results. Unless other otherwise indicated, I will be referencing non-GAAP figures. Please, refer to our earnings release for full GAAP to non-GAAP reconciliations. For the quarter, we generated Q2 GAAP revenues of $1.64 billion, $86 million above our May guidance. This includes the net recognition of deferrals of $256 million. Net bookings of $1.38 billion were $35 million above our May guidance. 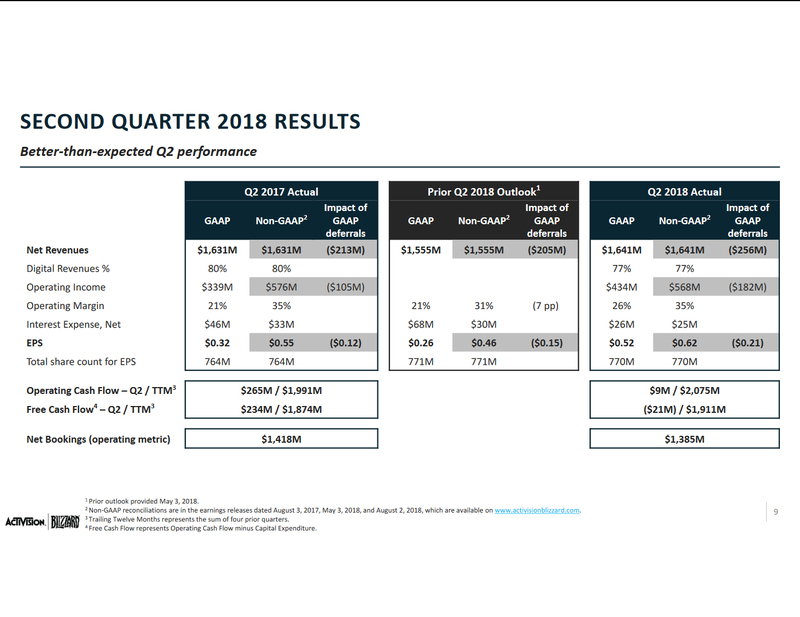 We generated Q2 GAAP EPS of $0.52 and Q2 non-GAAP EPS of $0.62, which was $0.26 and $0.16 above guidance respectively. These figures include the net recognition of deferrals of $0.21. During Q2, we entered into a closing agreement with the IRS to settle certain intercompany transfer pricing arrangements. We expect to pay approximately $345 million in cash related to the settlement mostly in the second half of the year. The settlement was the primary reason second quarter GAAP and non-GAAP earnings had a lower than anticipated tax rate; and following the settlement, we now expect our full-year tax rates to decrease with a GAAP tax rate of 13% (versus 18% previously), and a non-GAAP tax rate of 18% (versus 20% previously). From a cash flow and capital structure perspective, Q2 operating cash flow of $9 million includes the impact from higher year-over-year cash taxes and some working capital timing. On a trailing 12-month basis, operating cash flow of $2.08 billion is up modestly over the prior year. We paid a cash dividend of $0.34 per common share, which was up 13% year-over-year for a total of $259 million in aggregate to shareholders of record as of March 30, 2018. Our cash and investments at the end of June was approximately $5 billion, with domestic cash of roughly $4 billion as a result of our repatriation activity in Q2, and we ended the quarter with a net cash position of approximately $540 million. We indicated on our last call that we have board authorization to pay down as much as $1.8 billion of debt this year, and we now expect to utilize the full authorization in Q3. Before I turn to the specifics of our outlook, I'll provide some context on overall guidance and phasing of earnings for the remainder of the year. As I said on the last two calls, we expect revenues and operating income for 2018 to be more back-end loaded, given the timing of our major releases and content slate relative to the prior year. Conversely, Q4 of this year will fully benefit from two major releases, the August launch of World of Warcraft Battle for Azeroth, and the early Q4 release of Black Ops 4. So we are expecting a very strong final quarter, contributing meaningfully higher mix of full year revenue and earnings relative to last year. Now, while we still have a lot of execution ahead of us in the second half, we remain confident in our franchises, in our pipeline, and in our full-year outlook. Despite FX headwinds over the last quarter, we are maintaining our full-year guidance for revenue and we are raising our GAAP EPS forecast to reflect a lower tax rate from the IRS settlement that I mentioned earlier. With that context, for Q3, on a GAAP basis, we expect net revenues of $1.490 billion, including GAAP deferrals of $125 million. Product costs, game operations and distribution expenses of 27%; operating expenses including software amortization of 59%; and we expect GAAP interest expense of $62 million; a tax rate of 18%; GAAP and non-GAAP share count of $772 million; and EPS of $0.16. Interest expense is elevated due to one-time costs related to our planned debt pay down. 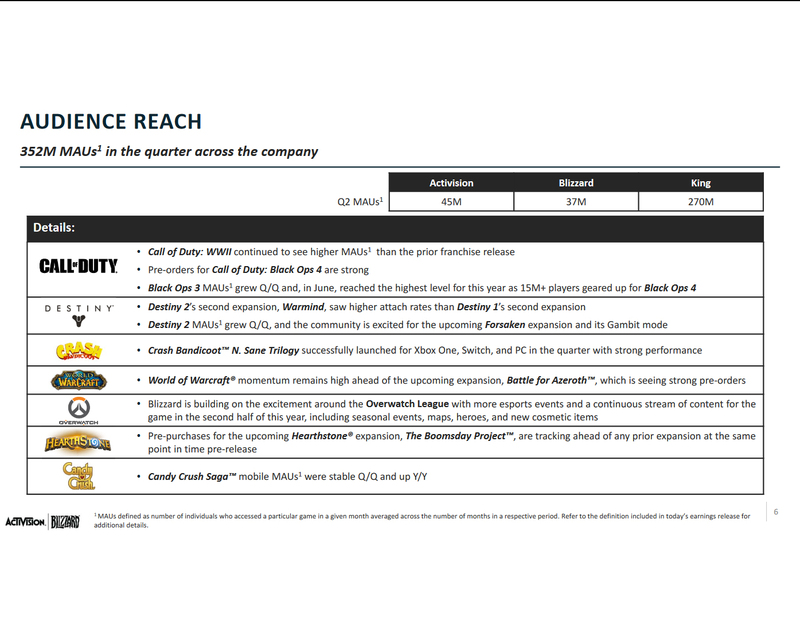 For Q3, on a non-GAAP basis we expect product costs, game operations, and distribution expenses of 27%. Operating expenses, including software amortization of 49%' and we expect non-GAAP interest expense of $20 million. A tax rate of 18%; and non-GAAP EPS of $0.37 -- including GAAP deferrals at $0.10. For 2018 on a GAAP basis, we expect net revenues of $7.355 billion, including GAAP deferrals of $120 million. Product costs, game operation and distributions expenses at 24%; and operating expenses, including software amortization of 52%. 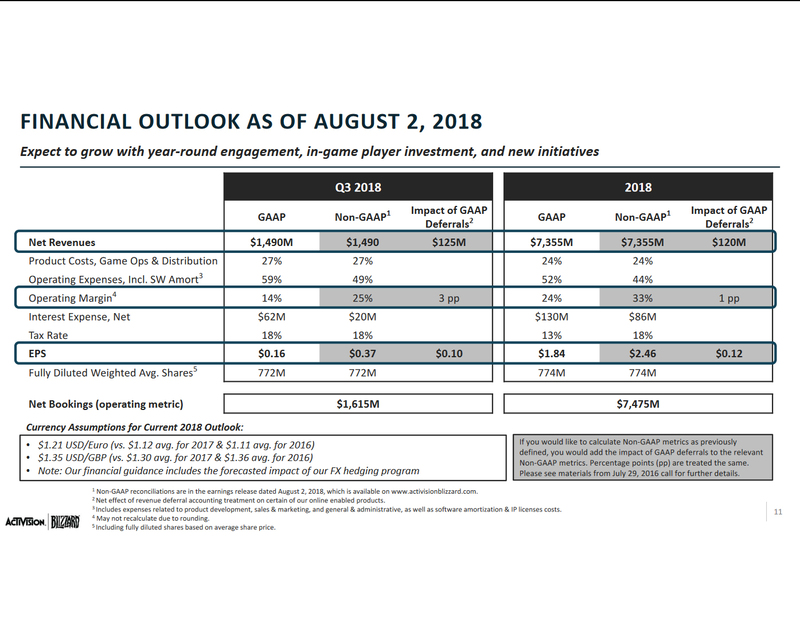 We expect GAAP interest expense of $130 million, a tax rate of 13%, GAAP and non-GAAP share count of $774 million with EPS of $1.84 ... and for 2018 on a non-GAAP basis, we expect product costs, game operations and distribution expenses of 24%. 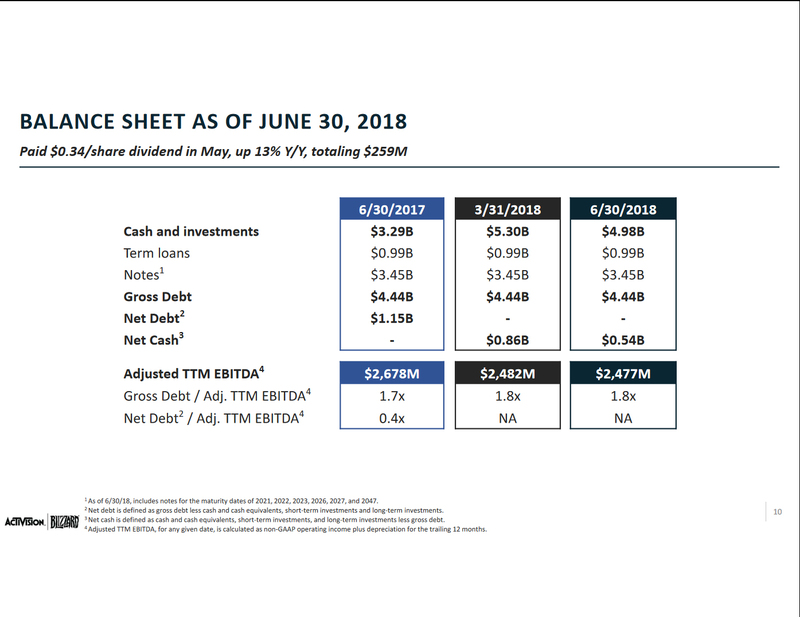 Operating expenses, including software amortization of 44%, and we expect non-GAAP interest expense of $86 million; a tax rate of 18%; and non-GAAP EPS of $2.46 -- including GAAP deferrals of $0.12. In conclusion, in Q2 we delivered better than expected results and sequential stability. We are looking forward to important launches in the second half; and all the while, we continue to make progress executing against our strategic initiatives, including mobile, the Overwatch League, and advertising. Colin Sebastian: My question is with the first season now complete for the Overwatch League, I was hoping you could reflect on some of the key learnings from the season and more broadly, what we can expect going forward from the franchise. Michael Morhaime: So Bobby talked about some of the success that we had in Season 1. I would like to have a shout-out to the team for delivering an awesome experience that definitely exceeded our expectations. Because of that success, as Bobby mentioned, we have already added two new great partners for Season 2, and we think that there will be more to come as well. Just quickly, I attended the Grand Finals last weekend in Brooklyn. I know many people listening were there as well. I hope everybody enjoyed it as much as I did. It was awesome to be part of the player and fan celebration, and we think that is just a start of a growing movement that will recognize and celebrate the best of Blizzard eSports in the future as well. Looking forward, there is a lot more for Overwatch fans to enjoy in the coming months, including eSports, in-game content, consumer products. For eSports, we have the Overwatch League All-Star Game later this month at the Blizzard Arena. We have the World Cup Finals at BlizzCon in November. There is a ton that we have been working on in-game as well. Our most recent hero, Wrecking Ball has done a great deal to generate buzz and engagement in the community. There is a lot of excitement for our upcoming seasonal events, Summer Games 2018, and we have some announcements that we will be making about new content at GamesCom, and at a fan festival in Seoul, South Korea, in August. We also, in addition to our partnerships with sponsors on the eSports side, we have also announced some new consumer products partners for the game. We have LEGO, Nerf, UNIQLO and Kellogg’s, and we think those partnerships will help us bring Overwatch to fans and new audiences throughout the world. So very excited about the future of Overwatch. Brandon Ross: In your press release, you mentioned strong pre-sales for Battle of Azeroth. Is there any further color you could give us there? And what are your current expectations overall for the expansion maybe relative to other World of Warcraft expansions? Michael Morhaime: So we are about two weeks away from the launch. Excitement is definitely building for this expansion, both inside Blizzard and with the World of Warcraft community. We have seen strong engagement as we released content updates, including the Battle for Azeroth pre-patch, and we have also had special story-based content to bridge players from Legion, our previous expansion, into the new expansion. We just started releasing some new animated shorts called the Warbringers series. 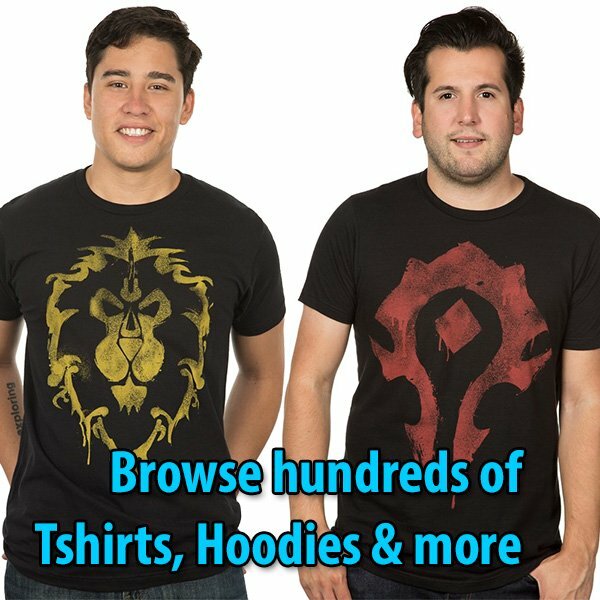 They tell the story of Battle for Azeroth. Those pieces have racked up more than 8 million views on YouTube already, and we are very, very excited about that; and we are gearing up for another major story drop pretty soon. We also removed a hurdle into how players can get started with the game. So we no longer require a box purchase up front. That has been met with a lot of positivity by the gaming press and the community. As Coddy mentioned, pre-orders have been strong. As always, we have some great content coming. The team has done a great job working both on the expansion, as well as on ongoing content, and increasingly improve a steady stream of content in between expansions — which we think is very important. I will also point out we are celebrating a big milestone with World of Warcraft. Today marks the 5,000th day that World of Warcraft has been in operation, and I think that a big kudos to the team for continuing to work on content and keep the game fresh, even after all this time. So there’s a lot to look forward to in the next couple weeks, and also beyond that. We are very excited about the expansion and the momentum heading into the launch.